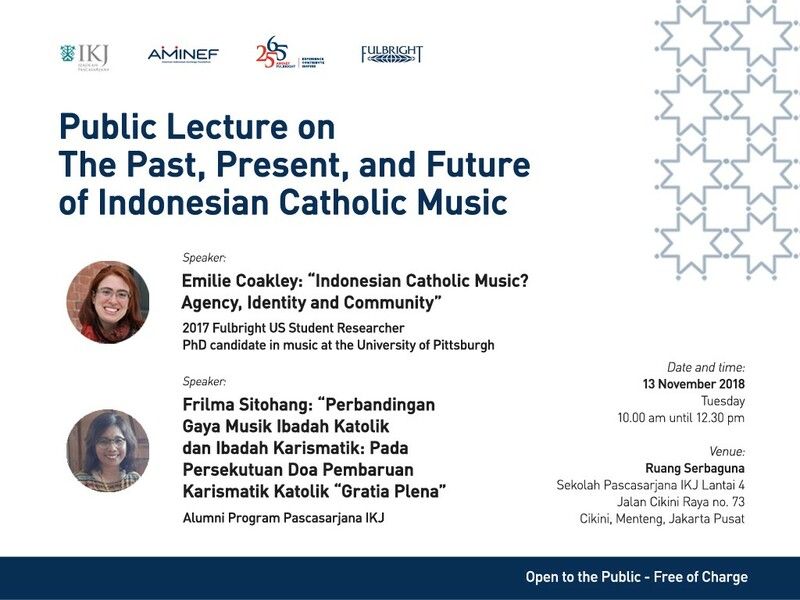 AMINEF and Program Pascasarjana Institut Kesenian Jakarta invite you to public lecture on The Past, Present, and Future of Indonesian Catholic Music by US Fulbright Student Research Emilie Coaklet on November 13, 2018 at 10.00 – noon, at IKJ, Jakarta with Frilma Sihotang, alumna Program Pascasarjana IKJ. Emilie Rose Coakley is a PhD candidate in music at the University of Pittsburgh whose Fulbright Student Research grant on “Catholic Music in Indonesia: Representation, Identity Formation, and Community Building” deals with how music is used to create and navigate religious identity at local, national, and global levels. Through her work, Emilie hopes to explore that ways in which Catholic music is in dialogue with broader musical and religious trends in Indonesia, while at the same time working towards mutual understanding among members of different religious communities. Her research is affiliated with Institut Seni Budaya Indonesia (ISBI) Bandung. This event is open to the public and free of charge. All are welcome. Through this project, I have examined the use of music in constructing Indonesian Catholic identity as it is in dialogue with larger socio-religious trends. Indonesia, the country with the largest Islamic population in the world, is also home to more than 7.5 million Catholics. Music is mobilized by Indonesian Catholics as a tool for identity formation and community building. Affirming a hierarchical model of Catholic leadership, the Center for Liturgical Music (Pusat Musik Liturgi or PML) in Yogyakarta is a site for the construction of inculturated music for the Indonesian Roman Catholic Church. While Indonesia is home to multiple religions, Catholicism functions differently due to its structure and missional history. At the same timie, Catholic religious practice and music are distinct from, yet influenced by, predominant musical and religious trends in Indonesia. Located throughout the archipelago, Indonesian Catholics are at the same time members of a universal Catholic community and citizens of a multi-faith nation-state. Musical materials—such as the Madah Bakti hymnal, produced by the PML—have become tangible signifiers through which an Indonesian Catholic identity is disseminated. While the PML is part of a broader global Catholic community, its institutional aim is to create and disseminate new liturgical music with localized musical expressions. The Madah Bakti hymnal is one attempt by PML leadership to construct an Indonesian Catholic identity that is understood as 100% Catholic and 100% Indonesian. At the same time, the experience of these materials and the production of other music materials is often different in “outer island” locations. Accordingly, while this project is sponsored by ISBI Bandung and includes research in Yogyakarta, Bandung, and Jakarta, I have examined “center-periphery” dynamics of music use and production in Flores and North Sumatra as well, which research has been informed by my time in Java. The methodology for this project has focused on musical ethnography, including data collected from interviews, singing with local choirs, and participation in weekly Masses and yearly musician training workshops. This work is be simultaneously historical, making use of the extensive archive of the PML’s library and libraries at schools and universities throughout Flores and Java. A combined ethnographic and historical approach will affirm the idea that contemporary narratives are always in dialogue with global, national, and missional histories. An inter-disciplinary approach will not only provide a more complete picture of how music functions for the Catholic community members in Indonesia but will position this work in reference to scholarship on music, religion, and identity construction in the fields of ethnomusicology, musicology, and the emerging field of congregational music studies. Ultimately, by conducting a critical examination of Indonesian Catholic music and identity formation, this study will contribute to a more nuanced understanding of how music and religion function in the fourth most populous nation in the world.